The Yoshioka Bingo.F3A is done, and it has been a journey. I bought the kit from Ishii Mokei several years ago and have built it in stages, enjoying it a lot. 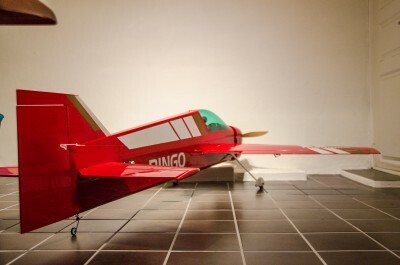 The Bingo.2M is originally a 3D plane for YS engines with oversized control surfaces. Mine is the first F3A-variant called Bingo.F3A with normal ailerons and elevators. 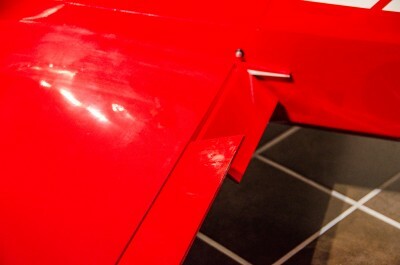 I ended up buying a new wing for it, the “Pro” version which has is fully sheeted, features more taper and flaps. So mine has ended up a hybrid. 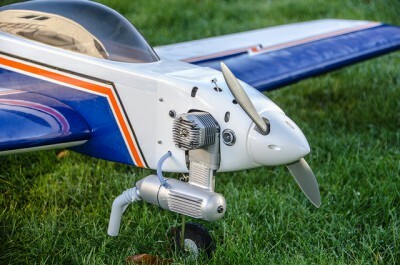 The current version being sold by Yoshioka has support for electric motors, angled stabilizers, smaller flaps and other minor modifications. 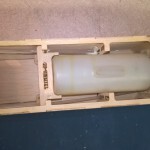 The finished weight is 3,85 kg without batteries. 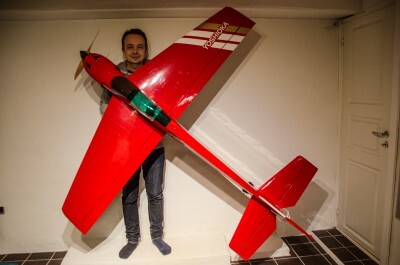 I’m using Hacker EcoX F3A 4600 batteries that weigh 900 grams, for a flying weight of just over 4,8 kg. That’s not bad considering it has a clear plastic cockpit and a pilot on board, and 7 full-sized servos! 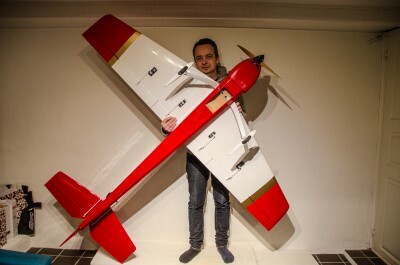 I could have made 4,5 kg if I had used a smaller RX battery, eliminated the flaps and pilot, smaller servos, used a carbon prop etc. The kit is extremely lightweight. The interior is spacious and fairly straightforward. 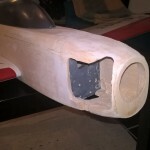 It took a bit of work to convert it to electric, with a reinforced battery tray and modified nose. Flaps allow for some creative mixing. When the throttle is pulled back, the entire wing can be an airbrake if I want it too. As always: more pictures to be found on my Flickr page. It’s done! Let’s hope it flies the way it looks. It’s brush painted enamel paint finish over silk tissue and dope, and the colors match my T-shirt from Venice Beach California! The idea is that it is classic looking with all-new modern technology. 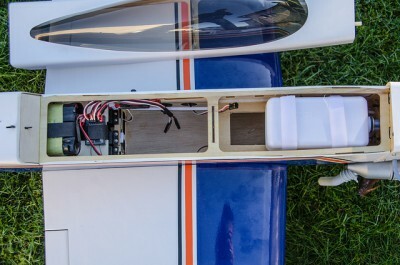 It has an O.S engines .65 AX engine, Futaba S-bus servos and Fasst 2.4 GHz control, and Powerbox iGyro 3e. Complete set of pictures is here, and the build is described in this post. 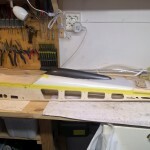 I wanted to build a plane from scratch last fall, and I chose the Joe Bridi designed Sun Fli 4, from 1968. Two plans exist online for this plane and I chose the RCM plan version. 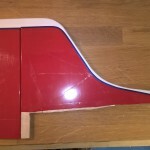 The plane has a variable airfoil which is thinner at the wingtips. Because of this, I chose to have foam cores cut. I had a plan to make this plane look original, but be all modern on the inside ,with Powerbox iGyro, Sbus servos and an O.S .65 AX engine. 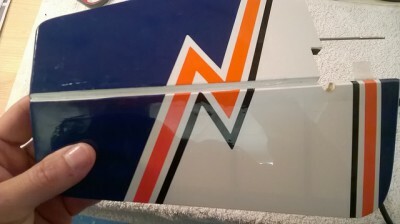 I want to paint it instead of covering it with plastic film, so I have finished the airframe and turned it over to my father to have it covered with tissue and dope. 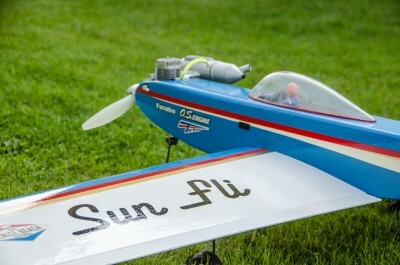 All the build pics are in the Sun Fli Flickr album. The Super Kaos 60 project came to a successful conclusion last summer. I’m very happy with how it turned out, particularly that it only weighs 2,8 kilos! The engine deserves special mention. After priming, it just fires right up by twisting the spinner slightly by hand. What a wonderfully magical metal mystery of fire, smoke, sound and happiness. Planes and engines like these are what will keep me in this madness for years to come. The engine tached 10.600 on an APC 11×9, and I tuned it down to 10.450 for consistent running. 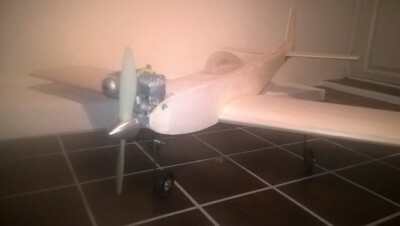 The 11×8 wood prop was (not surprisingly) all noise and no thrust. APC is the stuff. I have also replaced the stock muffler with a Hatori type 50-size muffler. 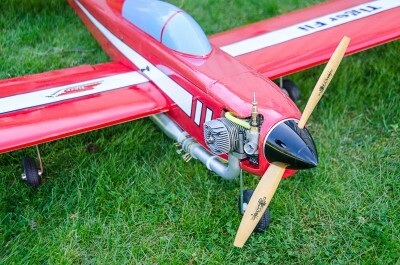 She flew beautifully, and the engine ran as it was made to – fast and loud! What a plane. 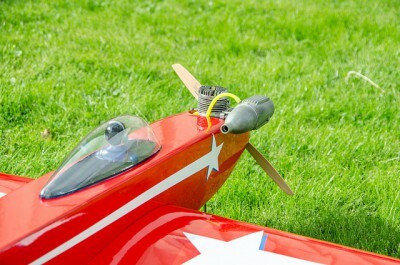 The low weight made for easy take-offs, big loops, fast rolls and slow landings. Perfect. 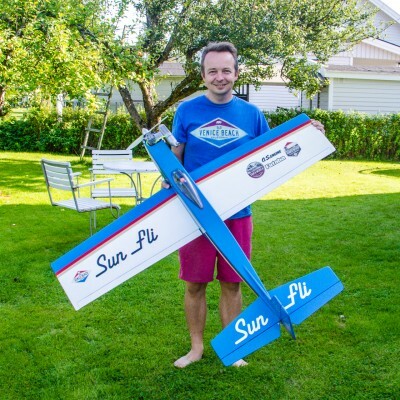 I enjoyed every minute of the build and the first flights. I have put all the photos from the build, finishing and flying up on Flickr and you can see them here. 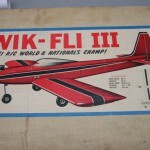 I’ve been fortunate enough to get my hands on a classic Great Planes Super Kaos 60 kit, new in box, from the early 1980s. Top condition. After it had been maturing like a fine wine for a year or so I could not resist it any longer. 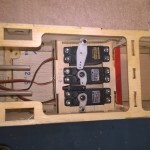 I’m knee-deep in building it, and as usual I’m posting all the build photos on my Flickr page, you can see them all here. 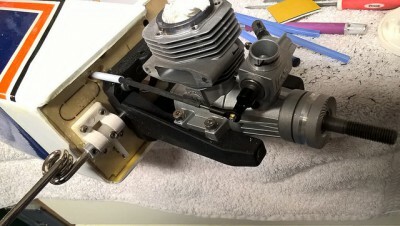 It will be powered by a restored O.S .61 FSR ABC, and guided by Futaba S-3151 and S-3152 servos and a Futaba 14SG Radio with a new FASSTest receiver. It will be simple and basic with fixed gear an Oracover finish. Done! Well, almost. 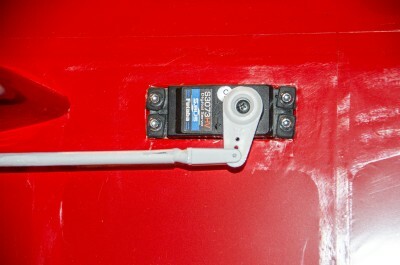 The wing mounting is fastened with four nylon bolts, two for each half. And because of the pushrods going to the tail I can’t reach the ones at the back. 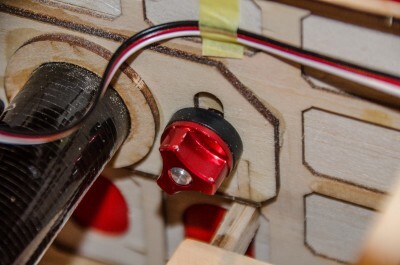 I have to modify it to make it more user friendly with a pin or screw to lock it in place, before I can fly it. But it looks like I wanted it to, it balanced perfectly, and hopefully it’ll still fly like the classic Tiger 2 does. More pictures in the Flickr album. Fin and rudder. 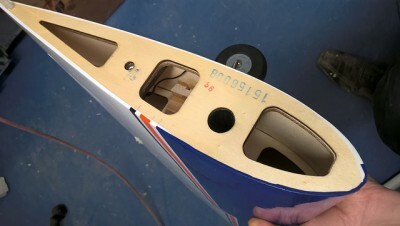 The rudder is an actually part for the ModelTech Calypso 60 ARC that I never used. Finally found a use for it! 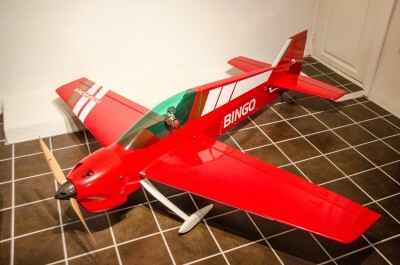 I’ve had a Phoenix Model Tiger 3 sitting in my attic for a long time. I’m a fan of the Goldberg Tiger 2 (had two) and I couldn’t resist this one when it was for sale by a fellow club member, unboxed but unbuilt. Problem was, I can’t stand to look at it. It’s a Tiger replica, and to my eyes it looks terrible since it’s not original. So I thought I’d modify it! By cutting off the turtle deck, adding a proper nose and a new covering, it might look more like a Kwik Fli. 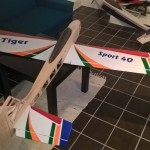 The Tiger Fli Project was born. Will it look a little like this when I'm done? When my “restomod” Killer Kaos went down due to flutter, it hurt and I sorely needed to get back in the saddle as quickly as possible. So I got the old plans out, ordered lots of balsa, and started cutting a new one. 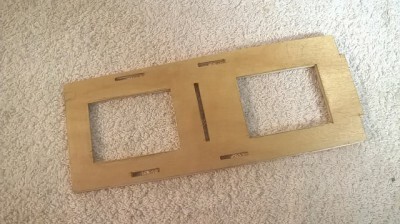 I discovered that the wing ribs on the Great Planes Ultra Sport 60 are identical, so I used those as templates for new ribs, with a few mods. 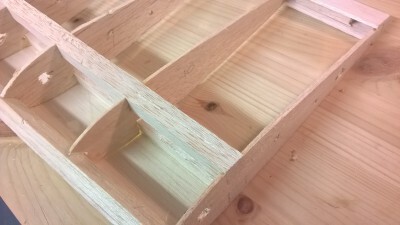 I used the opportunity to add two plywood joiners to reinforce the wing centre so it won’t need fibreglassing. In the above picture, the no. 11 rib, in the middle of the photo, is the single surviving useable wood part from the original Killer Kaos kit that I bought from Joe Bridi back in the day. At the time of writing, the wing is pretty much done, as are the tail feathers. 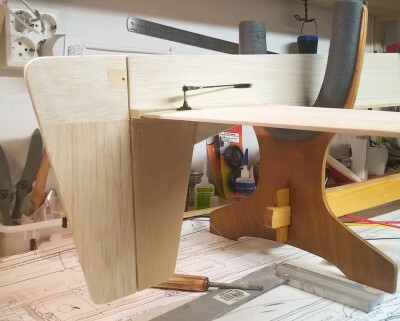 You can see the build documented on my Flickr page. New plane! 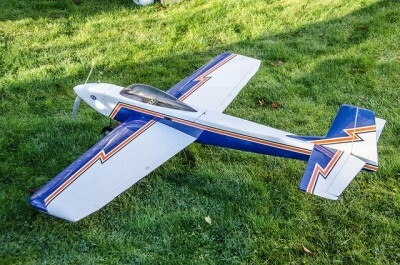 A very nice ARF from Tower Hobbies, which is relatively faithful to the Kaos design. 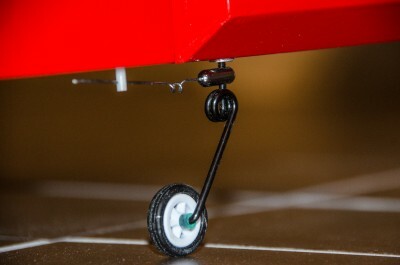 It features plug-in wings and a battery tray for electrics. 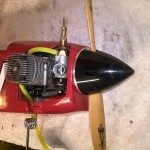 I opted for the glow-power option, using the O.S .65 AX engine with stock muffler. The ARF is very well designed and has lots of options for positioning radio gear to achieve proper balance. 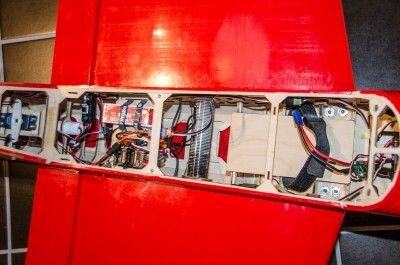 To achieve proper balance, I also had to install the throttle servo at the back of the radio bay along with the elevator and rudder servos. 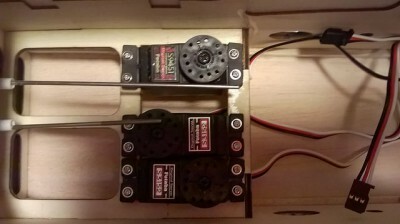 I had to lift one servo higher than another (the elevator servo in the middle, the mod is not shown in the picture) to achieve proper clearance between the elevator and rudder rod connectors. 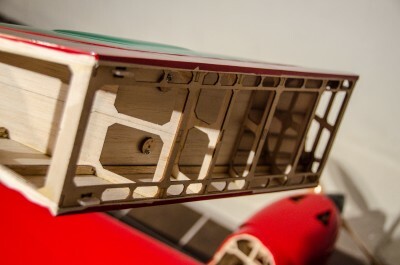 Since it is a glow-powered plane I varnished the inside of the wing root, and all areas of exposed wood. 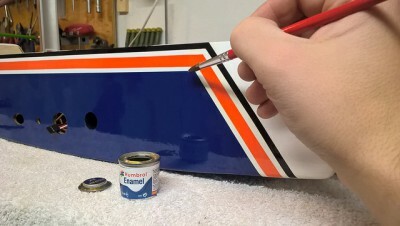 I also put a thin stripe of fuel proof laquer to seal all edges of the covering and trim, something I find extends the life of any model. 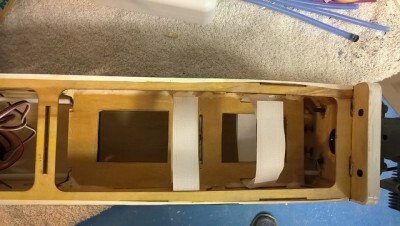 The rudder vas well hinged but poorly sanded so I had to re-hinge it with a larger gap, which I then sealed with a strip of white Oracover on both sides. Benefit is a gapless and aerodynamic hinge line. I also re-hinged the elevator and sealed the gap there too, because the joiner was glued in crookedly. 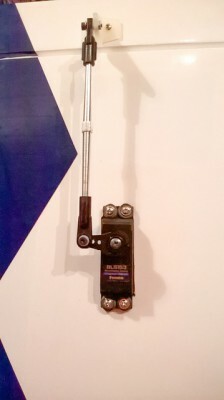 Throttle installation. The measurements for drilling the hole given by the manual is NOT correct. Mount your engine first and then measure yourself. Remember you have to clear the tank tray behind the firewall! The cylinder head must be removed in order to fit the cowling. There is a full size paper template provided in the manual, and that makes it easy to get a really good looking engine installation! Do not cut all holes at once. 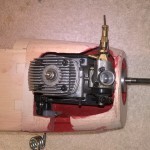 You do not need the hole for clearing the cast ridge on the carburetor, and the opening for the air intake is a little too far back so don’t trust the template entirely. One more thing: When positioning the engine, measure 142 mm from the rear of the firewall instead of the 140 mm stated in the manual. 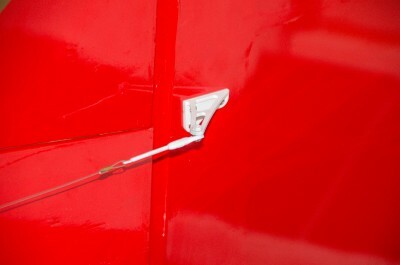 The two extra millimetres makes the cowling-to-spinner fitting easier to adjust. A very nice looking plane. Well done Tower Hobbies. 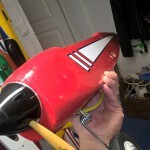 I haven’t had a chance to fly it at the time of writing, so in the meantime, enjoy the pictures here.